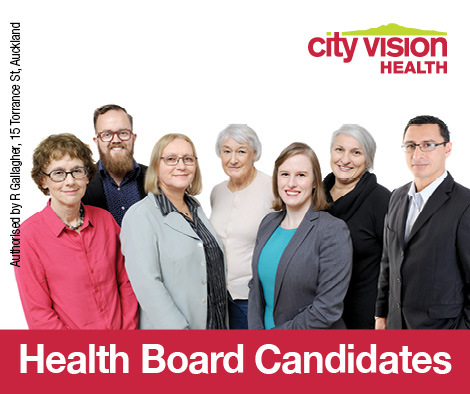 City Vision Health has 7 candidates standing for election to Auckland District Health Board (DHB) and wants Aucklanders to get involved, and vote for a health board that’s responsive to their needs and concerns. The DHB could be described as the “poor relation” of the more glamorous elements of the local government elections, attracting less interest and attention than the mayoralty, the council, and local boards, but its work affects our lives in wide-reaching and intimate ways: it’s life-changing. A tragedy then, that in previous elections so few of us have cast an effective vote for the DHB, and have missed out on the chance of electing a board willing to demand improvements within New Zealand’s faltering public health system. 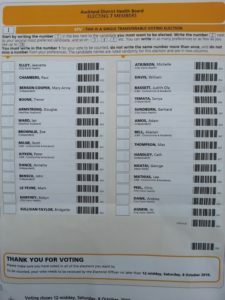 The way local government elections are organised and promoted does not encourage the majority of people to use their vote, and the DHB vote is further compromised by requiring a sudden switch to the STV system; many votes are invalid because voters don’t understand they need to number their choices, not tick them (or voters just give up at that point). Currently Auckland DHB is dominated by members who seem happy to rubber-stamp the government’s agenda for health, which involves cutting costs in ways that restrict the healthcare services that Aucklanders depend on now and in the future. The City Vision team will demand that Auckland gets a better deal from the government. Overall health spending has increased in dollar terms, as the health minister keeps saying, but what he doesn’t say is that it’s fallen behind Auckland’s growth and the changing needs of its population. The DHB health targets, set by the government, are a PR exercise which disguise the declining state of health services. City Vision Health wants the DHB to conduct itself with genuine transparency and invite participation so that Aucklanders get to see how decisions that affect their well-being are made, and have the opportunity to have their voices heard. The biggest factor in creating a healthy city is ensuring that everyone can afford good housing and good nutrition and has access to support services in times of need. City Vision Health will lobby government at all levels to push for these basic rights. The City Vision Health team is diverse, energetic and committed to being a voice for all Aucklanders. We urge voters to exercise their democratic right and be part of making Auckland healthier.